The news for FPV racing enthusiasts just keeps getting better. The little quad I’m about to share qualifies as a big headline. 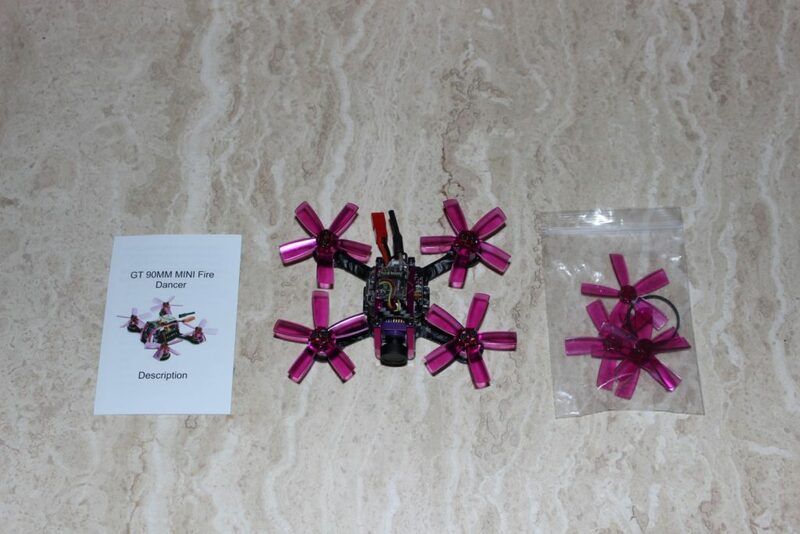 It’s the FuriBee GT 90mm Fire Dancer micro FPV brushless racing drone from GearBest.com. Four versions are available depending on one’s choice of radio, namely DSMX, Flysky, FrSky and plug-n-play. 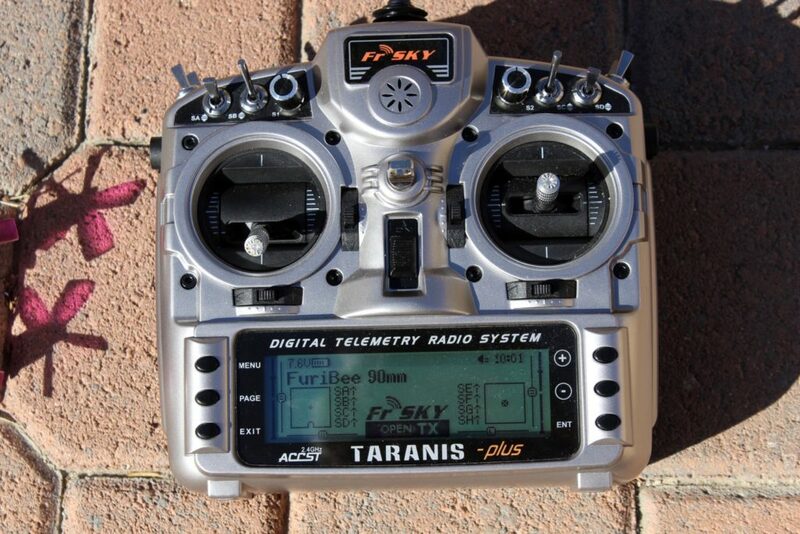 One of the most popular choices in FPV, or so it seems based on my research, is the FrSky Taranis X9 Plus radio system thanks in part to its open source programming. That’s the radio I’ll be using for this review. Pricing also depends on the choice of radio; the FrSky version sells for US$114.99 with free shipping via unregistered mail to the USA. GearBest sometimes offers flash sales which lower the price even further. This is a tremendous deal for FPV enthusiasts who’d rather fly than assemble a quality machine from discrete components. FuriBee has done all of the hard work and the results are astonishing. I’ll be testing the model with both two- and three-cell packs. 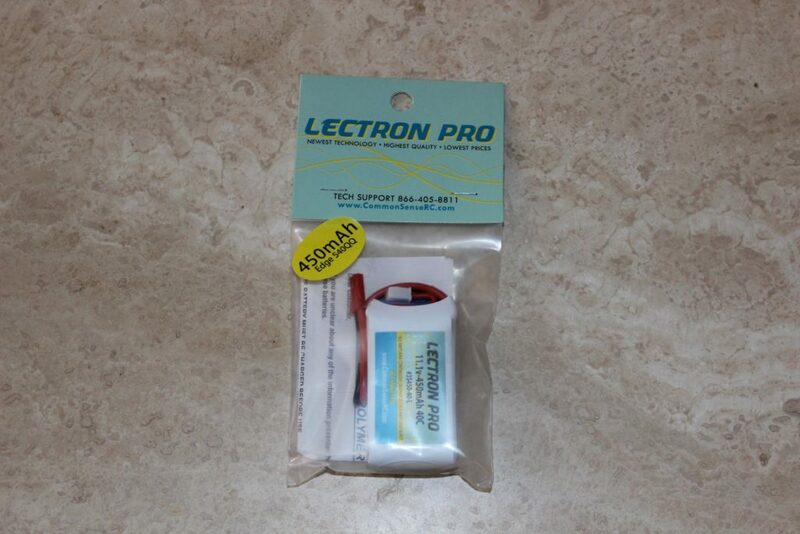 Anny and Marry, my contacts at GearBest, forwarded a pair of their GaoNeng 450mAh 2S 80C packs (yes, 80C) while Kenzier Lemmons of Common Sense RC sent over a Lectron Pro 450mAh 3S 40C pack. Goggles will be both my trusty RC-007 entry level goggles and the two-piece Tactic FPV-RM2 receiver/FPV-G1 combo from Natalie Rodrigues at Hobbico. The latter has a built-in DVR which will be necessary for recording in-flight video. 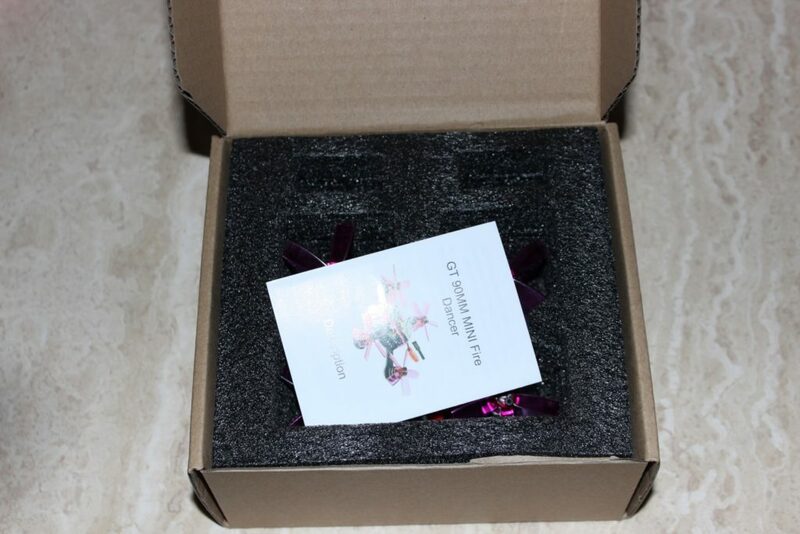 GearBest also forwarded two Tattu 450mAh 2s “slim” packs with uncommon XT30 connectors and a whopping 75C discharge rate! No problem there; I simply made an XT30 to JST adapter. These batteries are available with the proper JST plug; the XT30 version doesn’t show up on the website and may well be discontinued. There’s much to cover, so let’s begin! The GT arrived via DHL in only a few days and in perfect condition. 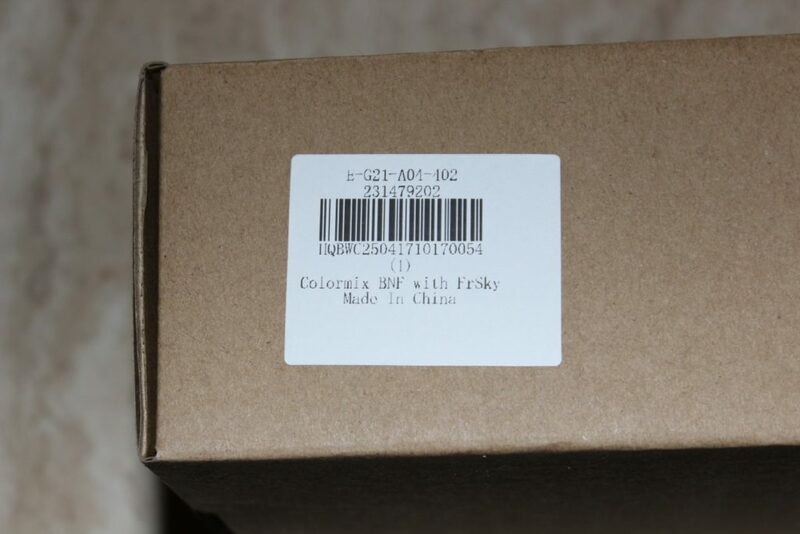 The product box is plain brown cardboard with a label identifying the contents, pretty much SOP for models of this type. As for the model itself, it came cradled in a foam tray along with the spares. Slots for two battery packs are cut into the foam and are a perfect fit for both the 2S and 3S packs used for the review. The model itself was, at first glance, an incredibly impressive piece of work. All wiring was routed neatly, all of the visible solder joints were well done and the magenta anodizing on the aluminum parts was flawless. For a mass-produced model presumably assembled at a hell-bent-for-leather pace, the FuriBee showed real care in its manufacturing and assembly. Considerably less impressive was the sparse, poorly translated manual. It presumes that the end user is familiar with the use of programming software and shows no parameters. It only shows basic specs, warnings and how each of the different radio protocols are bound to the model. The machine-translated English made it more difficult than it should have been, but to sum up, a FrSky user needs to select D8 mode before binding. 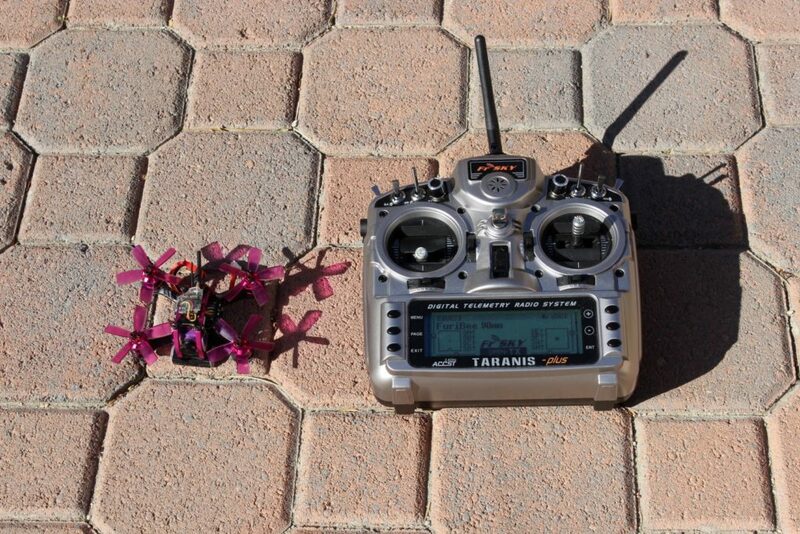 The manual incorrectly states that the quad is ready to fly after binding, but it isn’t. This is where the USB cable and programming software are necessary. The end user will have to determine how to arm the model as well as activating the optional functions such as angle and horizon via available switches. This is a small inconvenience since – joy of joys! – all of the other flight parameters were already set on my example. These parameters are an excellent starting point and I had no need to tweak them later. A quick check of the receiver and motor functions showed everything was working as advertised. Since I prefer to fly a quad line of sight and with stabilization for the first time, I left the goggles in the box and headed out to my front yard. Initial power was courtesy of a Mad Dog 450mAh 3S 40C pack from 2DogRC.com. I chose this pack since the other batteries had not yet arrived. For those who’ve never experienced a multirotor programmed with BLHeli firmware, a pleasant surprise awaits. Liftoff was as smooth and as gentle as I’ve experienced with similarly equipped quads. What I found surprising was how quiet the Fire Dancer was with its five-bladed props. I’d incorrectly assumed that it would be noisy, but such wasn’t the case. I have an inexpensive indoor novelty quad from GearBest which is noisier since the props are under the radials. Beginners, please note: With the angle and horizon modes programmed to switch on when arming, the flight characteristics were as solid as those of a beginner’s quad if not better. For those transitioning from a small beginner’s machine to a three-cell, brushless ballistic bundle, worry not. The model is gentle enough to fly in a living room with the stabilization armed, but unleashed outdoors or in a racing environment, look out. The high-revving, 7500kV outrunners and five-bladed props make for RIGHT NOW acceleration, speed and climbout. I haven’t done the math, but my initial guess of top speed was somewhere in the 80 mph (130km/h) neighborhood, perhaps faster. 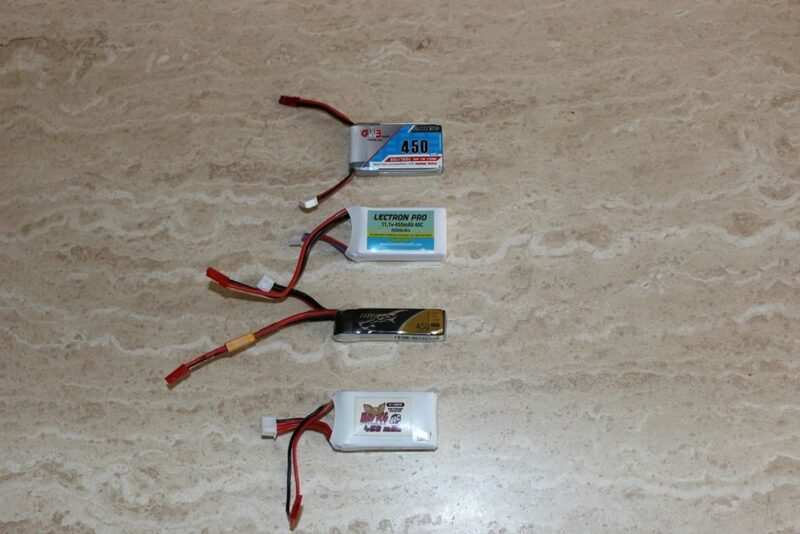 That kind of power in a 90mm quadcopter flown line of sight outdoors means that it will become very small very quickly. My usual tests of control and stabilization came next. Fast ascent followed by fast descent and sudden throttle up to stop the descent are ways I have of checking the gyros and the Fire Dancer performed perfectly. I then did a fast forward blast with rapid deceleration and reverse pitch. Again, flawless. This was shaping up to be a fantastic racing/freestyle platform. Next stops: FPV and video. My first attempts at FPV and DVR recording took place at the parade grounds shared by Southwest Community Church and the Indian Wells Tennis Garden, both in Indian Wells, California. With me were the two GaoNeng batteries and the Lectron Pro battery, all ready for their very first flights. Prior to that, I hadn’t really opened up the throttle. With all of the room I had, I figured that the time was now to do so before going FPV flying. Let me simply say this. The Fire Dancer, small enough to fit in the palm of a hand, is unbelievably fast on three cells. It is one of the fastest accelerating models of any type that I have ever flown and is every inch a competitive racer in my opinion. With its rudimentary coaxial VTX antenna, the video signal was appeared to be lacking in power as seen in the video and despite the use of a Hobbico pagoda receiver antenna. This led me to believe that the VTX is best suited for racing in close quarters. The coaxial aerial is soldered in place and lies horizontally and trying to bend the aerial upward may result in damage. I was genuinely disappointed since the little FuriBee showed such promise, but I wasn’t licked yet. I wanted to try one more thing. I repeated the test of the video transmission a couple of days later back at the parade grounds, this time with the RC-007 goggles and that same pagoda antenna. If the VTX was on the wimpy side, I wanted to see if it would act equally wimpy with the use of different goggles. Now I really had something. I flew the quad as far as I’d done before, perhaps further. The dropouts had all but disappeared! In an analog video signal, the burst signal which tells the receiver that the incoming transmission is in color is the first thing to disappear, resulting in a monochrome picture. Not so with this new combination. It worked to near perfection. I only wish the goggles had a DVR feature which I could have used to demonstrate the improved signal , but since they’re primarily for racing, I’d rather have the increased resolution and reception. I should point out that flying FPV with more than 25 milliwatts of VTX power will require a Technician Class amateur radio license or international equivalent. I have one, but those who want to juice up the power should consider obtaining the license. Code is no longer a requirement for any of the three licencing levels and the test itself is multiple choice. For those interested, the American Radio Relay League has a wealth of information. The camera sends a lot of information, including runtime, attitude, flight time and flight battery charge level. The latter is visible on the lower left of the display and blinks when it’s time to land. Pilots will still have some reserve to get back to the launch point, but since the Fire Dancer has no warning buzzer, the battery protection circuitry will kick in unexpectedly if it’s pushed too far and the model will land rather abruptly whether the pilot wants it to or not. A 33% drop in power might be expected going from the three-cell Lectron Pro to the two-cell GaoNeng, but such wasn’t the case here. The little FuriBee was still screaming fast and lighter in weight. That’s a great bit of news for both racers and freestyle flyers and since the battery capacity was the same, I noticed no difference in flight times. During later line-of-sight testing, the compact Tattu batteries didn’t disappoint in the least. There was still plenty of punch and I’ll say that the very light weight of the packs helped play a role. At just over ten bucks each, they’re quite a value. I am very much impressed with the FuriBee GT 90mm Fire Dancer. It arrives assembled, nearly ready to fly and, quite possibly, for less money than one might spend on separate components and a frame. 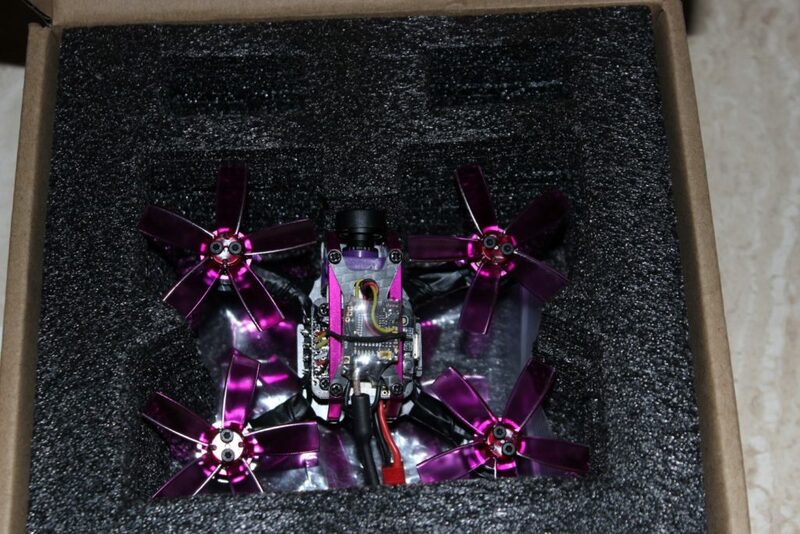 It has no bad flying habits, it’s staying screwed together after several flights and if anything is lacking, it’s the nearly nonexistent documentation, no easy way to upgrade the VTX antenna and no low voltage buzzer. It’s a marvelous flyer, well made and pilots of all skill levels would do very well to consider one. Two thumbs up all the way. This little quad is a winner through and through. Once more, it’s my pleasure to thank Anny at GearBest for offering this model and the battery selection. Thanks as well go to Nathan Maat at the administrators’ desk here at RC Universe on behalf of all of you wonderful hobbyists in our audience.